Micro fishing weights are small to very small split shot or other weights that will get your bait or fly down to where the fish are but aren't too heavy to use with very sensitive floats. 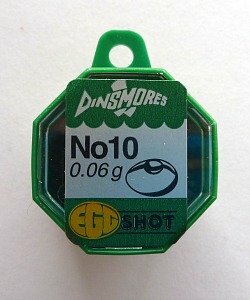 These are single size packs of #10 shot which is the smallest environmentally friendly non-lead shot I've found in the US. The #10 is just enough weight to make the tanago floats set properly and is also the right size for the Unibobbers. What I find truly bizarre, though, is that while tin shot is widely hailed as being safe for the environment, each package has a label which says, in capital letters, "WARNING This product contains a chemical known to the state of California to cause cancer and birth defects and other reproductive harm." Realistically, the same warning should probably be given to people using lead split shot, and lead shot has been used for generations. I do sometimes wonder how we as a species could possibly have survived for four million years without having all those government warnings. Like anything else, use reasonable caution and you should be fine. The #10 shot are seriously small and I would recommend the Dr. Slick Spring Creek clamps for applying them. The jaws on the Spring Creek clamps taper to quite a point, which is what you'll want to grab and hold the very small shot.